In the present job market, it is very crucial for the interviewer to filter candidates by one on one face to face interview. Sometimes, it is believed a face to face interview gives very accurate feedback about candidates than other modes of interview. But, in reality it is very difficult to sum up all the candidates in one place and conduct series of face to face interviews. This is because the interview area might become very crowded and also it becomes expensive to gather huge number of candidates in one place. And hence, the best and economic way of conducting preliminary levels of interview is through phone. Nowadays, final level of interview is also conducted through phone. Telephonic interviews are becoming very popular due to its convenience and interviewer gets enough amount of time to decide upon the candidate. Telephonic interviews happens mostly for a short amount of time. Generally, it happens for around 30-45 minutes. Sometimes when the job level requires more judging it goes for hours together. The very first step the interviewer would expect is to pick up the call as fixed through an email. And, always the interviewer’s motto in telephonic interviews would be to do an interview as short as possible as they do not see the candidate face to face, and obviously he cannot judge other than the voice of the candidate. Here are the quick short general tips for attending a telephonic interviews. 1. Attend the call immediately as the interview is pre fixed already. Remember to allot a very silent place for attending the interview. Be it home or office, peaceful environment is very important. 2. Do not get panic or ramble when you hear the voice of the interviewer on the other side. It is natural to get tensed, but remember to be calm as you might miss out the right way of putting the answers when you get panic. 3. A rule of thumb is to keep the answers minimal until and unless it is very much needed. Keep your answers less than two minutes, if needed you will be asked for a brief one. So, stick to minimal answers. These are the few tips before facing a telephonic interview. 1. General interview questions (Non-technical). Most of the telephonic interviews generally start with general interview questions which belongs to non-technical category. General interview questions have to be answered with lots of attention. Prepare well with the basic set of questions before attending the telephonic interview. 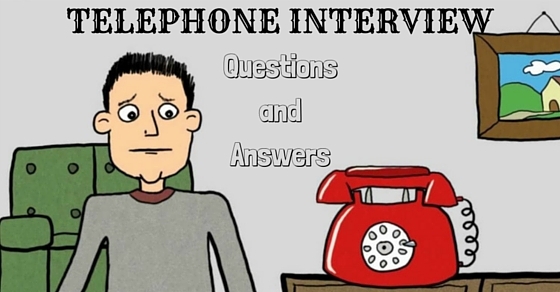 Here are the few very common HR telephonic interview questions and answers to study. This is the most default interview question which most of them would face very first in a telephonic interview. It is very important to know how to answer this question professionally. Always try to keep it minimal describing your personal front and show the interviewer more about your professional life. Speak about your career history in short and stick to less than two minutes. Your answer should be very relevant to the job role you have applied. This is because, in every single question the answer which you reply will be valuated with the applied job role. Hence, answer professionally in short. This interview question differs based on experienced or a fresher candidate. The real intention of this question is to know whether you are really interested about the vacant position you have applied for or will you stick to the job when given to you. In case of experienced, the question would be about the reason behind switching job. The answer should be very positive and diplomatic telling very non- specific reasons like you wanted more challenging environment rather complaining about your previous employer. In case of a fresher, explain positively about your expectations with respect to the job role applied and also speak about your knowledge about the job role, you have applied. Interviewers generally tend to know about your knowledge about how far you have done a research about the organization. So, this interview question is common for both fresher as well for an experienced candidate. Try to do a basic research about the organization and answer few basic information like about the founders, major turnover news or acquisitions about the organization. Speaking about the mission of the organization is also a bonus when answering this interview question. The main purpose of this question is to verify your answer with the answer updated in the resume and also to know whether you fit into the vacant job role with your previous experiences. Try to answer this question crispy about your previous designation and the star features of your previous job role. Do not just repeat the same lines mentioned in your resume, and rather add more interesting like a conversation in a very live manner. Try to show confidence in your voice and also try not to go in very detail as it might dig deeper about your previous job issues. Speaking about highlights of your previous job role is very tricky as well as important question to be answered too. Given this question, try to answer your major turning points and previous job achievements in simple words. Do not speak using complex terms as sometimes the interviewer on the other end might have not worked similar to your previous job role. Make sure your tone does not sound like bragging about yourself and also remember not to cook stories as sometimes it might back fire. This is another very common interview question which most of the job seekers would face in a telephonic interview. Before answering this question, try to learn more about the market salary scale and also the organization’s salary structure. This would help you to quote a salary which is really negotiable. Do not quote unrealistic salary negotiation which will end up to a bad image. Speak to the point in a humble tone. 7. Can you take me through your resume? Interviewers usually ask this interview question, randomly for many to 2 main purposes. To verify whether the data in resume is true or is it up to your knowledge. To have a glance on your resume, quickly by you, to know more about you. When answering this question, make sure you speak exactly what is there in your resume. And secondly, try to keep it minimal by just briefing only about education and employment history. The other best option could be asking the interviewer himself about what does he/she wants to know. This way could be acceptable in telephonic interviews, as there is short of time. The main purpose of this interview question is to know whether you would stick to the job if hired. So, even if you have a plan of quitting the job later for your career aspirations, do not add anything while you’re answering this questions. Be clear and show your career aspirations related to the job you have applied. Talk very positively and humbly about your aspirations of climbing the ladder in the same organization. It is the most possible interview question, if the candidate almost gets through the interview. Try to give an answer which is very honest and do not bluff a date to impress the interviewer. Even if you are not sure about the date, try to analyse yourself when could it be maximum suitable for you and then answer this interview question. Honesty is the only thing expected out of this interview question. This interview question does not belong to any brainier category. It is the way of ending the interview with a positive note. So, answer it in a very relaxed manner and keep it simple ones. Like you can ask about very casual ones like about the work culture, team strength, and fun activities etc. Until and unless you have a serious question to ask, keep this interview question in a very light manner. Every candidate would face interview questions from technical aspect. This set of interview questions would be related to your previous job experience or subject matter expert questions. So, be it whichever sector you belong to, try to prepare well for technical interview questions. The rule of thumb here is to keep it short and be clear in your answer. Spend enough amount of time to prepare this part as it is the prime reason for conducting the interview. Also remember to do a research on the job role you have applied and prepare technically according to the expectations of that job role specifically. Telephonic interviews are never a nightmare if you have a good amount of preparation. It is the easiest mode of interview when you have prepared well. The best part is the candidate gets a chance to select the environment, no fear of facing interviewers, and there is no chance of missing out on time too. Henceforth, preparation and few quick tricks is the key to win a telephonic interview. Hope this post gives you a clear view about how to face the interview questions with confidence both technically and non-technically.